LANEIGE has been on a roll recently with their new product launches, but one of their most famous launches so far is probably their two tone products. Ranging from lip to contour, it seems like everything can be two-toned. A few other K-beauty brands have also jumped on the bandwagon as of late, but LANEIGE is probably one of the best-known pioneers of this trend. I first bought the Two Tone Lip Bar thanks to PPL with Lee Sung Kyung, followed by the Tint Lip Bar. Both have a very nice sheen to them, but with different product features – the Lip Bar is a cream/stain lipstick, while the Tint Lip Bar is, well, a tint and balm combined into one. You can read my respective reviews on them, but in a nutshell, I prefer the Tint one for its better staying power and colour. 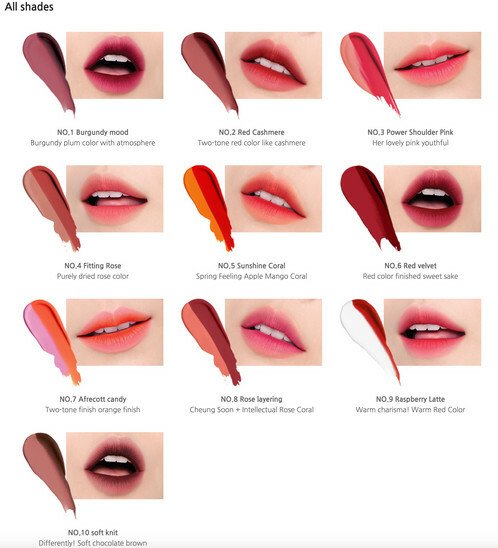 I’ve got my eyes on LANEIGE’s latest Matte launches, because the colours look absolutely amazing ~ I’m particularly interested in #3, #4, #7, #8, and #9. I guess I just really like the pink shades because they look so flattering on any skin tone. Have any of you tried these shades yet? Let me know which ones work for you! That is a really nifty idea. Cuts down on your makeup time, because trying to get that effect yourself would be a bit more time consuming.